Nikken's VC Holders are a variant developed from our hugely successful Slim Chuck with the emphasis placed more on the demands and requirements for milling and profiling applications. As with the Slim Chuck all VC Holders are equipped with our TiN Bearing Nut technology. This provides users with optimum gripping torque, improves rigidity and delivers outstanding & reliable run-out accuracy of less than 3 microns at 4xD. The VC Holder therefore provides superior machining performance, excelling with high-speed applications up to 40,000rpm. VC Holders use Nikken's exclusive TiN bearing loaded nut which drastically reduces friction and allows greater thrust during tightening. The system, as with the Slim Chuck adopts an 8 degree collet taper for improved gripping torque and higher precision. Design considerations of the VC Holder include an increased wall thickness which improves rigidity and stability during any cutting operation. Run-out accuracy is guaranteed at less than 3 microns at 4D. The collet design includes taper and square wedge location and a rear precision pilot diameter which reduces vibrations and drastically improves both surface finish and tool life. TiN Bearing Nut [HV2, 220]. Collet taper and square wedge design. 8 degree internal taper for increased gripping torque. Rear pilot diameter on collet for extra milling stability. Thicker wall design for improved rigidity. 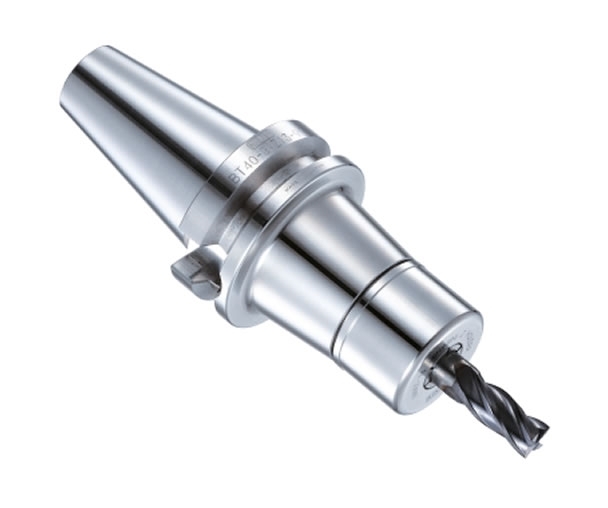 Suitable for high-speed machining applications [40,000 rpm]. Run-out accuracy of less than 3 microns. Available as standard on Nikken 2-Lock for both BT and DIN tapers the VC Holder also offers the benefits of dual contact for both flange and taper on suitable machine tools (2-Lock is also fully compatible with standard BT/DIN type spindles). 2-Lock increases the contact area considerably from around 44.4mm to 63mm (BT40) and also, as with all our NC tooling products, provides users with over 80% taper contact as standard. Additional standard options of course also include HSK taper.